Google’s News Alerts have been around for some time so I’m sure most people are familiar with them. For those of you that read our blog, you’ll remember two earlier postings about how to use Alerts, both written by Dave McAnally about reputation management. Once you have it set the way you want it, you’ll begin to receive alerts as soon as the setting allows. Help you develop negative keywords to add to your campaign. By watching what the news outlets are writing about, you can stay ahead of traffic that might come your way. Alerts are a great way to find negatives to keep this traffic from altering your metrics. For example, if you are working on a banking client and your goal is registrations, you may have a CPA goal. If there are rumors of a bankruptcy, then you can safely assume that there will be an increase in searches for “bank name bankruptcy” resulting in inefficient traffic. By adding the word “bankruptcy” as a negative you can mitigate some of the negative effects of this unwanted traffic. Adding keywords such as “layoff” or other negative news items will help keep the research traffic away. Use this to supplement your search query report research. This is one of many uses for Google Alerts, but it’s a simple addition to your routine and can produce great results. Add it to your routine as soon as you can. 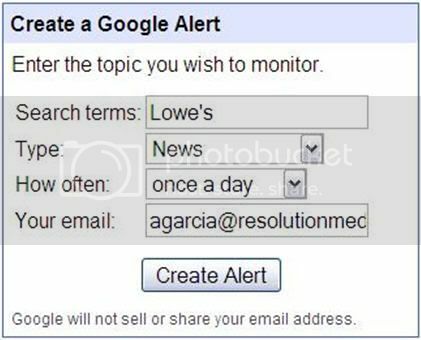 For webmasters, blog masters, link builders, and website owners, you can also use Google alerts to see who and when someone links to you. Do a Comprehensive Alert for news on "link:www.yourwebsite.com" and you'll get those helpful updates.